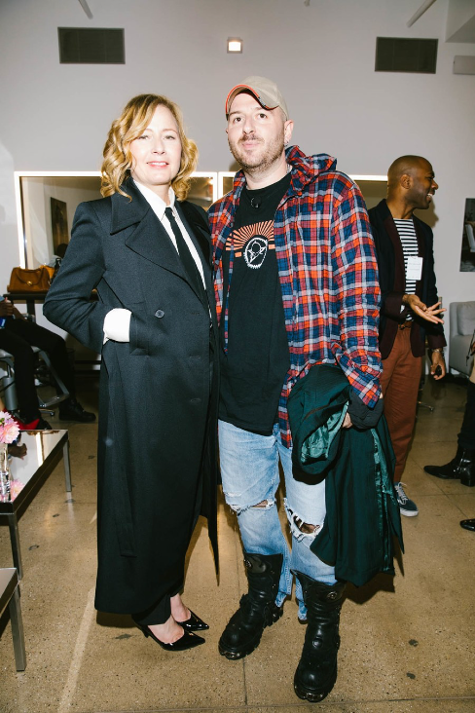 Vogue’s first Forces of Fashion event was held at Milk Studios in Chelsea, Manhattan on October 12, 2017. To start off the day, Milk hosted a “day break event” that started promptly at 7 a.m. in its penthouse. The day break event offered pressed juice, coffee, and Milk Studios makeup artists. At 8:30, Anna Wintour gave her opening remarks talking about the first Forces of Fashion conference. At 9:15, the "Future of Ethical Fashion" panel started with Stella McCartney. Tonne Goodman moderated the conversation. They talked about great design, ethical fashion, and McCartney's own start in the fashion industry. When McCartney started in the industry, she said, she was ridiculed for not being able to sell luxurious garments without using real fur or leather. Her goal was for consumers to purchase her products because they look luxurious but are made from eco-friendly material. From the start, McCartney’s fashion house has always been environmentally sustainable. She talked about how technology is the future of fashion. At 9:50 AM, the "Power of Independence" panel with Dries Van Noten, moderated by Vogue International Editor Hamish Bowles, began. During this panel, Noten discussed his fashion shows. Noten brought up the fact that he started working with fashion companies in India in 1987 doing embroidery. When Bowels brought up the subject of politics, Noten claimed that he is already politically involved with his clothes, and he doesn't need to speak on the topic directly. At 11:10 AM, Vogue Creative Digital Director Sally Singer talked about fashion in the age of Instagram with Marc Jacobs and Kevin Systrom (the co-founder of Instagram). Last year, 50 million people watched Fashion Month on Instagram. This year, 150 people viewed Fashion Month via Instagram. During this panel, both Jacobs and Systrom discussed having “optimistic” companies. “How can we build technology for kindness?” Systrom asked. Kevin wanted to know what kind of legacy Instagram can leave on the world, while Jacobs discussed how fewer people are experiencing his shows live. At 11:45 AM, the "Being on First-Name Terms With the World" panel started with Virginia Smith talking with Michael Kors about his career, the time he assisted his mother with her wedding dress, and the issue of diversity on the runway. At 12:35 p.m, "Star Power in the 2010’s" started with Erdem Moralioglu, Simon Porte Jacquemus and Joseph Altuzarra, moderated by Mark Holgate. The panelists discussed reviews, social media, advertising, and fame as it relates to being a designer. Moralioglu feels that the idea of a "star" means somebody who is famous for fashion has a distinct style that separates them from other people. “I think it has much do with the idea of handwriting a point of view,” he said. Jacquemus assessed the reviews of his collections. “For me, the only review I believe is in a ‘regram or a retweet. It's all about the amount of people sharing something—that's the real review,” he said. He also touched on the subject of social media, saying that his pictures have a deeper meaning than what people see; it might be the color inspiration, or an idea for a new look. Altuzarra talked about his latest collection as well. This was Beckham’s new career (post-Spice Girls) and not just a licensing job. At 3:30, "Can you Keep Cool...Cool?" began with Heron Preston and Off-White’s Virgil Abloh. They talked about meeting each other on the internet, how much they hate the word “cool,” and “how a whole new generation is defining what the city is to them.” Preston also talked about being inspried to collaborate with the New York Department of Sanitation when he was on a dirty beach in Ibiza. Abloh talked about how 17-year olds are now defining luxury. “Cool Kids want to be rich, rich kids want to be cool," Abloh said. "The friction between that is something we’ve always noticed…the luxury world wants so hard to be ‘cool’ and be in the streets, and that is something really becoming relevant." Her current fashion obsessions are “tailored looks that feel fresh and youthful.” Regarding Fenti Beauty, she said she had always wanted to get into the beauty industry.